Matter is defined as anything that occupies space and has mass, and it is all around us. Solids and liquids are more obviously matter: We can see that they take up space, and their weight tells us that they have mass. Gases are also matter; if gases did not take up space, a balloon would stay collapsed rather than inflate when filled with gas. Solids, liquids, and gases are the three states of matter commonly found on earth ([link]). A solid is rigid and possesses a definite shape. A liquid flows and takes the shape of a container, except that it forms a flat or slightly curved upper surface when acted upon by gravity. (In zero gravity, liquids assume a spherical shape.) Both liquid and solid samples have volumes that are very nearly independent of pressure. A gas takes both the shape and volume of its container. The three most common states or phases of matter are solid, liquid, and gas. A fourth state of matter, plasma, occurs naturally in the interiors of stars. A plasma is a gaseous state of matter that contains appreciable numbers of electrically charged particles ([link]). The presence of these charged particles imparts unique properties to plasmas that justify their classification as a state of matter distinct from gases. In addition to stars, plasmas are found in some other high-temperature environments (both natural and man-made), such as lightning strikes, certain television screens, and specialized analytical instruments used to detect trace amounts of metals. In a tiny cell in a plasma television, the plasma emits ultraviolet light, which in turn causes the display at that location to appear a specific color. The composite of these tiny dots of color makes up the image that you see. 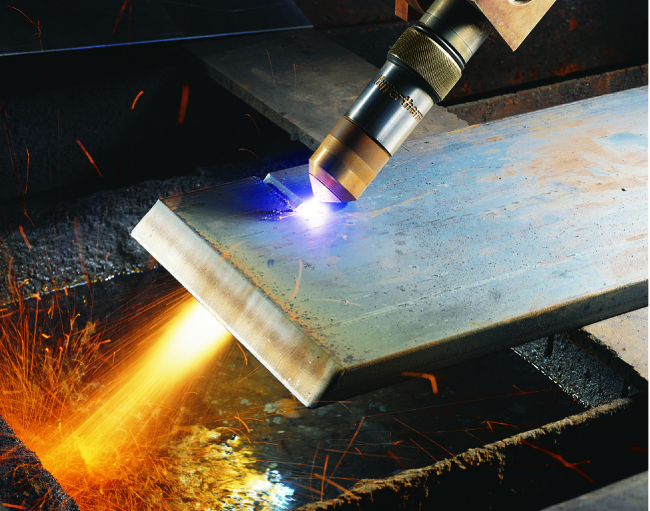 Watch this video to learn more about plasma and the places you encounter it. Some samples of matter appear to have properties of solids, liquids, and/or gases at the same time. This can occur when the sample is composed of many small pieces. For example, we can pour sand as if it were a liquid because it is composed of many small grains of solid sand. Matter can also have properties of more than one state when it is a mixture, such as with clouds. Clouds appear to behave somewhat like gases, but they are actually mixtures of air (gas) and tiny particles of water (liquid or solid). The mass of an object is a measure of the amount of matter in it. One way to measure an object’s mass is to measure the force it takes to accelerate the object. It takes much more force to accelerate a car than a bicycle because the car has much more mass. A more common way to determine the mass of an object is to use a balance to compare its mass with a standard mass. The law of conservation of matter summarizes many scientific observations about matter: It states that there is no detectable change in the total quantity of matter present when matter converts from one type to another (a chemical change) or changes among solid, liquid, or gaseous states (a physical change). Brewing beer and the operation of batteries provide examples of the conservation of matter ([link]). During the brewing of beer, the ingredients (water, yeast, grains, malt, hops, and sugar) are converted into beer (water, alcohol, carbonation, and flavoring substances) with no actual loss of substance. This is most clearly seen during the bottling process, when glucose turns into ethanol and carbon dioxide, and the total mass of the substances does not change. This can also be seen in a lead-acid car battery: The original substances (lead, lead oxide, and sulfuric acid), which are capable of producing electricity, are changed into other substances (lead sulfate and water) that do not produce electricity, with no change in the actual amount of matter. (a) The mass of beer precursor materials is the same as the mass of beer produced: Sugar has become alcohol and carbonation. (b) The mass of the lead, lead oxide plates, and sulfuric acid that goes into the production of electricity is exactly equal to the mass of lead sulfate and water that is formed. Although this conservation law holds true for all conversions of matter, convincing examples are few and far between because, outside of the controlled conditions in a laboratory, we seldom collect all of the material that is produced during a particular conversion. For example, when you eat, digest, and assimilate food, all of the matter in the original food is preserved. But because some of the matter is incorporated into your body, and much is excreted as various types of waste, it is challenging to verify by measurement. An atom is the smallest particle of an element that has the properties of that element and can enter into a chemical combination. Consider the element gold, for example. Imagine cutting a gold nugget in half, then cutting one of the halves in half, and repeating this process until a piece of gold remained that was so small that it could not be cut in half (regardless of how tiny your knife may be). This minimally sized piece of gold is an atom (from the Greek atomos, meaning “indivisible”) ([link]). This atom would no longer be gold if it were divided any further. The first suggestion that matter is composed of atoms is attributed to the Greek philosophers Leucippus and Democritus, who developed their ideas in the 5th century BCE. However, it was not until the early nineteenth century that John Dalton (1766–1844), a British schoolteacher with a keen interest in science, supported this hypothesis with quantitative measurements. Since that time, repeated experiments have confirmed many aspects of this hypothesis, and it has become one of the central theories of chemistry. Other aspects of Dalton’s atomic theory are still used but with minor revisions (details of Dalton’s theory are provided in the chapter on atoms and molecules). An atom is so small that its size is difficult to imagine. One of the smallest things we can see with our unaided eye is a single thread of a spider web: These strands are about 1/10,000 of a centimeter (0.0001 cm) in diameter. Although the cross-section of one strand is almost impossible to see without a microscope, it is huge on an atomic scale. A single carbon atom in the web has a diameter of about 0.000000015 centimeter, and it would take about 7000 carbon atoms to span the diameter of the strand. To put this in perspective, if a carbon atom were the size of a dime, the cross-section of one strand would be larger than a football field, which would require about 150 million carbon atom “dimes” to cover it. ([link]) shows increasingly close microscopic and atomic-level views of ordinary cotton. An atom is so light that its mass is also difficult to imagine. A billion lead atoms (1,000,000,000 atoms) weigh about 3 10−13 grams, a mass that is far too light to be weighed on even the world’s most sensitive balances. It would require over 300,000,000,000,000 lead atoms (300 trillion, or 3 1014) to be weighed, and they would weigh only 0.0000001 gram. It is rare to find collections of individual atoms. Only a few elements, such as the gases helium, neon, and argon, consist of a collection of individual atoms that move about independently of one another. Other elements, such as the gases hydrogen, nitrogen, oxygen, and chlorine, are composed of units that consist of pairs of atoms ([link]). One form of the element phosphorus consists of units composed of four phosphorus atoms. The element sulfur exists in various forms, one of which consists of units composed of eight sulfur atoms. These units are called molecules. A molecule consists of two or more atoms joined by strong forces called chemical bonds. The atoms in a molecule move around as a unit, much like the cans of soda in a six-pack or a bunch of keys joined together on a single key ring. A molecule may consist of two or more identical atoms, as in the molecules found in the elements hydrogen, oxygen, and sulfur, or it may consist of two or more different atoms, as in the molecules found in water. Each water molecule is a unit that contains two hydrogen atoms and one oxygen atom. Each glucose molecule is a unit that contains 6 carbon atoms, 12 hydrogen atoms, and 6 oxygen atoms. Like atoms, molecules are incredibly small and light. If an ordinary glass of water were enlarged to the size of the earth, the water molecules inside it would be about the size of golf balls. The elements hydrogen, oxygen, phosphorus, and sulfur form molecules consisting of two or more atoms of the same element. The compounds water, carbon dioxide, and glucose consist of combinations of atoms of different elements. We can classify matter into several categories. Two broad categories are mixtures and pure substances. A pure substance has a constant composition. All specimens of a pure substance have exactly the same makeup and properties. Any sample of sucrose (table sugar) consists of 42.1% carbon, 6.5% hydrogen, and 51.4% oxygen by mass. Any sample of sucrose also has the same physical properties, such as melting point, color, and sweetness, regardless of the source from which it is isolated. We can divide pure substances into two classes: elements and compounds. Pure substances that cannot be broken down into simpler substances by chemical changes are called elements. Iron, silver, gold, aluminum, sulfur, oxygen, and copper are familiar examples of the more than 100 known elements, of which about 90 occur naturally on the earth, and two dozen or so have been created in laboratories. Pure substances that can be broken down by chemical changes are called compounds. This breakdown may produce either elements or other compounds, or both. Mercury(II) oxide, an orange, crystalline solid, can be broken down by heat into the elements mercury and oxygen ([link]). When heated in the absence of air, the compound sucrose is broken down into the element carbon and the compound water. (The initial stage of this process, when the sugar is turning brown, is known as caramelization—this is what imparts the characteristic sweet and nutty flavor to caramel apples, caramelized onions, and caramel). Silver(I) chloride is a white solid that can be broken down into its elements, silver and chlorine, by absorption of light. This property is the basis for the use of this compound in photographic films and photochromic eyeglasses (those with lenses that darken when exposed to light). Many compounds break down when heated. This site shows the breakdown of mercury oxide, HgO. You can also view an example of the photochemical decomposition of silver chloride (AgCl), the basis of early photography. The properties of combined elements are different from those in the free, or uncombined, state. For example, white crystalline sugar (sucrose) is a compound resulting from the chemical combination of the element carbon, which is a black solid in one of its uncombined forms, and the two elements hydrogen and oxygen, which are colorless gases when uncombined. Free sodium, an element that is a soft, shiny, metallic solid, and free chlorine, an element that is a yellow-green gas, combine to form sodium chloride (table salt), a compound that is a white, crystalline solid. A mixture is composed of two or more types of matter that can be present in varying amounts and can be separated by physical changes, such as evaporation (you will learn more about this later). A mixture with a composition that varies from point to point is called a heterogeneous mixture. Italian dressing is an example of a heterogeneous mixture ([link]). Its composition can vary because we can make it from varying amounts of oil, vinegar, and herbs. It is not the same from point to point throughout the mixture—one drop may be mostly vinegar, whereas a different drop may be mostly oil or herbs because the oil and vinegar separate and the herbs settle. Other examples of heterogeneous mixtures are chocolate chip cookies (we can see the separate bits of chocolate, nuts, and cookie dough) and granite (we can see the quartz, mica, feldspar, and more). A homogeneous mixture, also called a solution, exhibits a uniform composition and appears visually the same throughout. An example of a solution is a sports drink, consisting of water, sugar, coloring, flavoring, and electrolytes mixed together uniformly ([link]). Each drop of a sports drink tastes the same because each drop contains the same amounts of water, sugar, and other components. Note that the composition of a sports drink can vary—it could be made with somewhat more or less sugar, flavoring, or other components, and still be a sports drink. Other examples of homogeneous mixtures include air, maple syrup, gasoline, and a solution of salt in water. Although there are just over 100 elements, tens of millions of chemical compounds result from different combinations of these elements. Each compound has a specific composition and possesses definite chemical and physical properties by which we can distinguish it from all other compounds. And, of course, there are innumerable ways to combine elements and compounds to form different mixtures. A summary of how to distinguish between the various major classifications of matter is shown in ([link]). Depending on its properties, a given substance can be classified as a homogeneous mixture, a heterogeneous mixture, a compound, or an element. Eleven elements make up about 99% of the earth’s crust and atmosphere ([link]). Oxygen constitutes nearly one-half and silicon about one-quarter of the total quantity of these elements. A majority of elements on earth are found in chemical combinations with other elements; about one-quarter of the elements are also found in the free state. Water consists of the elements hydrogen and oxygen combined in a 2 to 1 ratio. Water can be broken down into hydrogen and oxygen gases by the addition of energy. One way to do this is with a battery or power supply, as shown in ([link]). The decomposition of water is shown at the macroscopic, microscopic, and symbolic levels. The battery provides an electric current (microscopic) that decomposes water. At the macroscopic level, the liquid separates into the gases hydrogen (on the left) and oxygen (on the right). Symbolically, this change is presented by showing how liquid H2O separates into H2 and O2 gases. The breakdown of water involves a rearrangement of the atoms in water molecules into different molecules, each composed of two hydrogen atoms and two oxygen atoms, respectively. Two water molecules form one oxygen molecule and two hydrogen molecules. The representation for what occurs, will be explored in more depth in later chapters. The two gases produced have distinctly different properties. Oxygen is not flammable but is required for combustion of a fuel, and hydrogen is highly flammable and a potent energy source. How might this knowledge be applied in our world? One application involves research into more fuel-efficient transportation. Fuel-cell vehicles (FCV) run on hydrogen instead of gasoline ([link]). They are more efficient than vehicles with internal combustion engines, are nonpolluting, and reduce greenhouse gas emissions, making us less dependent on fossil fuels. FCVs are not yet economically viable, however, and current hydrogen production depends on natural gas. 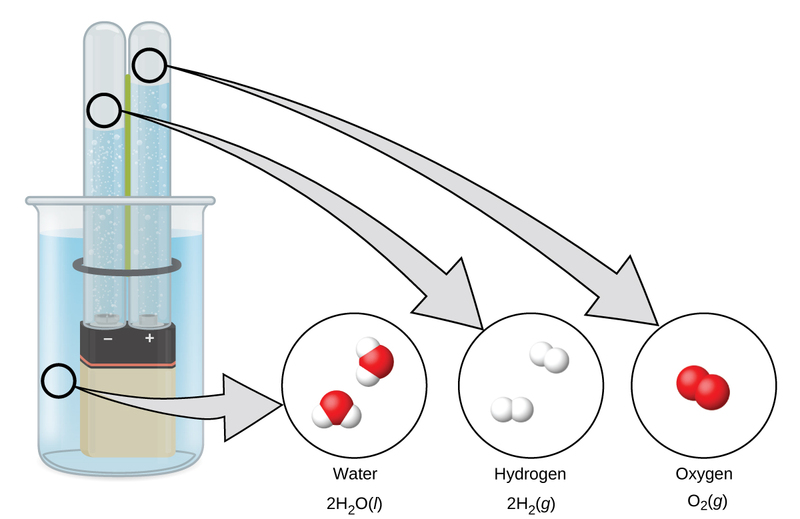 If we can develop a process to economically decompose water, or produce hydrogen in another environmentally sound way, FCVs may be the way of the future. 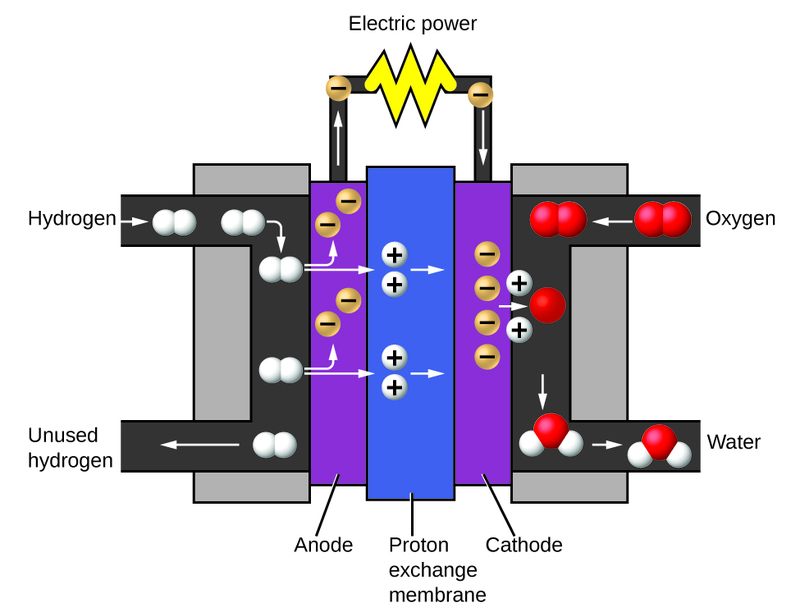 A fuel cell generates electrical energy from hydrogen and oxygen via an electrochemical process and produces only water as the waste product. Imagine how different your life would be without cell phones ([link]) and other smart devices. Cell phones are made from numerous chemical substances, which are extracted, refined, purified, and assembled using an extensive and in-depth understanding of chemical principles. 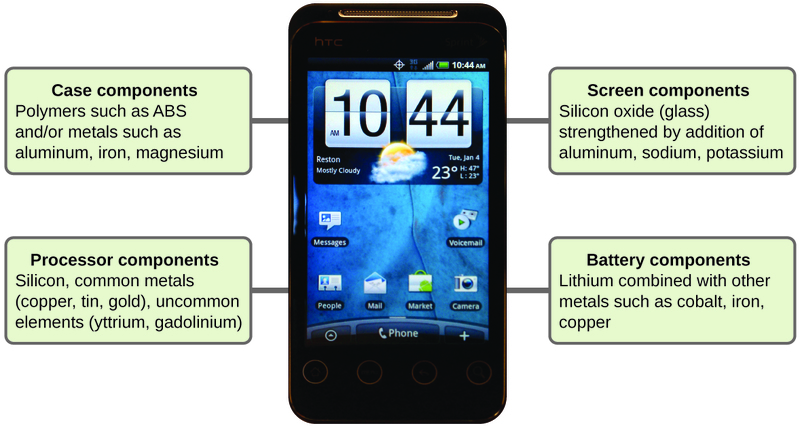 About 30% of the elements that are found in nature are found within a typical smart phone. The case/body/frame consists of a combination of sturdy, durable polymers comprised primarily of carbon, hydrogen, oxygen, and nitrogen [acrylonitrile butadiene styrene (ABS) and polycarbonate thermoplastics], and light, strong, structural metals, such as aluminum, magnesium, and iron. The display screen is made from a specially toughened glass (silica glass strengthened by the addition of aluminum, sodium, and potassium) and coated with a material to make it conductive (such as indium tin oxide). The circuit board uses a semiconductor material (usually silicon); commonly used metals like copper, tin, silver, and gold; and more unfamiliar elements such as yttrium, praseodymium, and gadolinium. The battery relies upon lithium ions and a variety of other materials, including iron, cobalt, copper, polyethylene oxide, and polyacrylonitrile. Matter is anything that occupies space and has mass. The basic building block of matter is the atom, the smallest unit of an element that can enter into combinations with atoms of the same or other elements. In many substances, atoms are combined into molecules. On earth, matter commonly exists in three states: solids, of fixed shape and volume; liquids, of variable shape but fixed volume; and gases, of variable shape and volume. Under high-temperature conditions, matter also can exist as a plasma. Most matter is a mixture: It is composed of two or more types of matter that can be present in varying amounts and can be separated by physical means. Heterogeneous mixtures vary in composition from point to point; homogeneous mixtures have the same composition from point to point. Pure substances consist of only one type of matter. A pure substance can be an element, which consists of only one type of atom and cannot be broken down by a chemical change, or a compound, which consists of two or more types of atoms. What properties distinguish solids from liquids? Liquids from gases? Solids from gases? Liquids can change their shape (flow); solids can’t. Gases can undergo large volume changes as pressure changes; liquids do not. Gases flow and change volume; solids do not. How does a heterogeneous mixture differ from a homogeneous mixture? How are they similar? How does an element differ from a compound? How are they similar? How does an atom differ from a molecule? In what ways are they similar? Many of the items you purchase are mixtures of pure compounds. Select three of these commercial products and prepare a list of the ingredients that are pure compounds. Answers will vary. Sample answer: Gatorade contains water, sugar, dextrose, citric acid, salt, sodium chloride, monopotassium phosphate, and sucrose acetate isobutyrate. A sulfur atom and a sulfur molecule are not identical. What is the difference? How are the molecules in oxygen gas, the molecules in hydrogen gas, and water molecules similar? How do they differ? In each case, a molecule consists of two or more combined atoms. They differ in that the types of atoms change from one substance to the next. We refer to astronauts in space as weightless, but not without mass. Why? As we drive an automobile, we don’t think about the chemicals consumed and produced. Prepare a list of the principal chemicals consumed and produced during the operation of an automobile. Gasoline (a mixture of compounds), oxygen, and to a lesser extent, nitrogen are consumed. Carbon dioxide and water are the principal products. Carbon monoxide and nitrogen oxides are produced in lesser amounts. Matter is everywhere around us. Make a list by name of fifteen different kinds of matter that you encounter every day. Your list should include (and label at least one example of each) the following: a solid, a liquid, a gas, an element, a compound, a homogenous mixture, a heterogeneous mixture, and a pure substance. When elemental iron corrodes it combines with oxygen in the air to ultimately form red brown iron(III) oxide which we call rust. (a) If a shiny iron nail with an initial mass of 23.2 g is weighed after being coated in a layer of rust, would you expect the mass to have increased, decreased, or remained the same? Explain. (b) If the mass of the iron nail increases to 24.1 g, what mass of oxygen combined with the iron? (a) Exactly one pound of bread dough is placed in a baking tin. The dough is cooked in an oven at 350 °F releasing a wonderful aroma of freshly baked bread during the cooking process. Is the mass of the baked loaf less than, greater than, or the same as the one pound of original dough? Explain. (b) When magnesium burns in air a white flaky ash of magnesium oxide is produced. Is the mass of magnesium oxide less than, greater than, or the same as the original piece of magnesium? Explain. (c) Antoine Lavoisier, the French scientist credited with first stating the law of conservation of matter, heated a mixture of tin and air in a sealed flask to produce tin oxide. Did the mass of the sealed flask and contents decrease, increase, or remain the same after the heating? (a) If 200.0 g of glucose is fully converted, what will be the total mass of ethanol and carbon dioxide produced? (b) If the fermentation is carried out in an open container, would you expect the mass of the container and contents after fermentation to be less than, greater than, or the same as the mass of the container and contents before fermentation? Explain. (c) If 97.7 g of carbon dioxide is produced, what mass of ethanol is produced? Phases and Classification of Matter by OpenStaxCollege is licensed under a Creative Commons Attribution 4.0 International License, except where otherwise noted.